Melissa's Pinwheels seventh grade project was a huge success! Her first project for 7th grade always includes using a variety of media and artists to help students get used to how things run in her room. The front of the pinwheels are based on the work of Van Gogh Oil Pastels ), Georgia O'Keeffe (Watercolor Paint ), Mondrian (Colored Markers - or try Tempera Paint ) and Op Art (marker). The back was Jackson Pollack (tempera or acrylic). She also had the students paint their sticks and add ribbon if they wanted. They really turned out great AND they spin! You could do this all in Acrylic Paint on some kind of plastic so they could stay on display for a few days. Substitute any other artists or have the kids choose their own "isms"/styles/works of art. Do a little writing and comparison for each "ism". 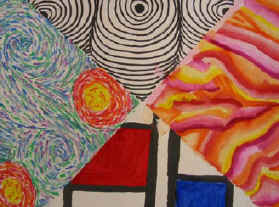 These "in the style of" projects, expose students to variety of styles and techniques in a short amount of time. They learn a little bit of art history in the process and are become familiar with modern art styles. Select "isms" and artists that interest you. She likes to have students use a variety of media for their first project to help them learn about the materials and how she runs her classroom (care of materials, clean up, etc.). She finds that students don't realize that oil pastels blend (they are always so amazed!). Most students use watercolors like they were made only for paint by number paintings - ad this project gives them a chance to experiment without fear. Step 1: Cut stiff Drawing Paper into 6" (15 cm) squares. Each student will get a square. 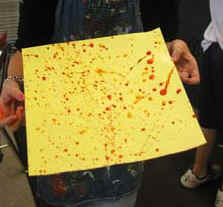 Step 4: Color, paint, or sketch your design on both sides of the paper. It is the student's choice if they put different designs on each side of the paper. Step 5: When the design is completed and dried (if applicable), use Scissors to cut along the marker lines you made 2/3 of the way in from the corners. Step 7: Once every other tip is stuck in the middle of the square, stick the pin and pinwheel into a straw or dowel rods . Variation: Pinwheels for Peace. See their template and gallery. Do lesson as above learning about four "isms". Write messages for PEACE on the back side (or print messages on the paper first before doing the four "isms" most printers will take tag board. 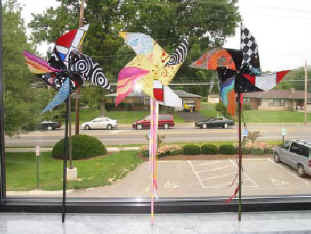 Pinwheels for Peace - Installation project conceived by Ann Ayers and Ellen McMillan. Make pinwheels any size - or use template - decorate and plant throughout your community on September 21 (Arbor Day and World Peace Day). 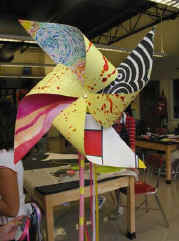 Cut out Pinwheel - assemble with small Peace symbol in center and plant around your school grounds. This project demonstrates the big ideas of world peace and making an international connection at the same time. Students will be given a pinwheel template, and asked to write a message/wish that relates to world peace. On the other side of their paper, students will create a drawing that illustrates their message. On September 21 (International World Peace Day) students will gather in the ruins to "plant" their pinwheels, with the knowledge that children all over the world are simultaneously thinking/visualizing world peace, thus creating an international connection. I enjoy the work of an outsider artist named Vollis Simpson. I first saw his motion machines in the film "Twister". I use examples of his work in a lesson plan that ties Newton's laws of motion to creating motion art. 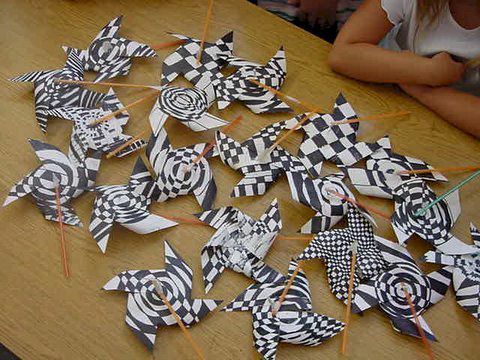 The Science Museum of Minnesota has a wonderful site that explores Mr. Simpson's wind driven art works, and gives many links to lessons and ideas for other kinetic student art projects, including pinwheels. Betsy's students made Op Art Pinwheels and secured them to straws.